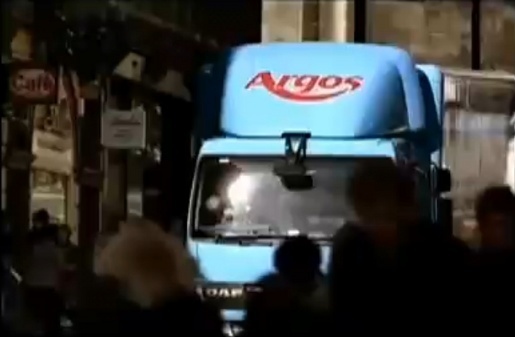 Argos, the catalogue-based chain of stores in the UK and Ireland, features 140 extras running through the streets of Newcastle and Haringey in this year’s Christmas television advert, to the sounds of Perry Como singing “It’s beginning to look a lot like Christmas”. Additional product-focused 10 and 20 second tv ads over Christmas will be voiced by Dermot O’Leary and Davina McCall. The Argos Christmas campaign was developed at Clemmow Hornby Inge by creative director Micky Tudor and agency producer Savannah Jones-Middleton. Filming was directed by Chris Dada via Academy Films, London, with producer Juliette Harris and director of photography Darran Tiernan. Post production was done at Moving Picture Company. Sound was produced at Scramble. Music is “It’s Beginning To Look A Lot Like Christmas”, sung by Perry Como and the Fontaine Sisters.